I've had these photos sitting in my drafts for a while now, but I'm sharing it with you now as my contribution to the "Bloggers Around the World" challenge created by Chris from Cooking Around the World. The first round's theme is Germany! Yay! I thought this would be the perfect opportunity to share this recipe with you*, and indulge in a bit of cultural discussion. The depiction and impressions of Germany in Chris' post really resonated with me, and I'm glad I found the time to join in the challenge! Here in Australia, the image we have of Germany and German food tends to be Bavarian (you know, Oktoberfest, Lederhosen, Dirndls, pork knuckle, Weisswurst, those blue-and-white chequered flags) - but Bavaria is just one part of this country, which I've come to learn is very diverse in language, culture and food. (And that's before you take recent waves of immigration into the equation!) On my last couple of trips to Germany, I remember being amazed that you could drive twenty minutes, and be in a town where the people have a different accent, and use different words for the same thing. I also remember asking some Lampertheimers about frankfurter Grüne Soße (a common recipe in "German" cookbooks) and being told, "I'm not sure what that is, it must be something that people in Frankfurt eat, I've never seen it". Frankfurt's only a 30 minute drive from Lampertheim!! Cray cray! Oma Frieda's cooking notebooks are amazing - she was 95 when she sadly passed away last year, so you can imagine how old her notebooks are. Many of them are written in Old German, which few people read or write these days (it's lucky that Sandra knows how!). 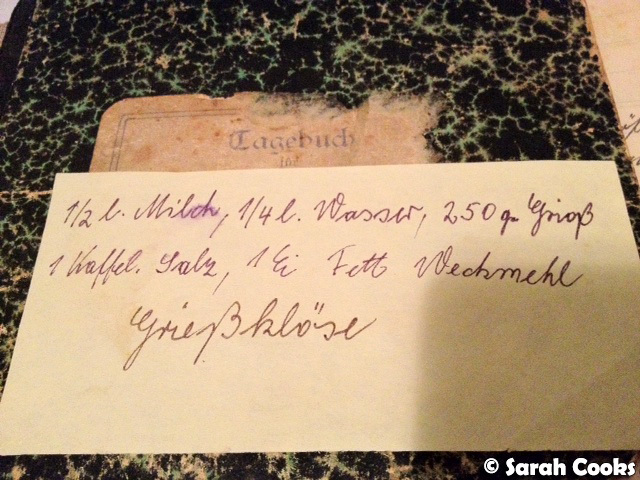 However, lots of her notes are written in an even older script: Sütterlin, which I'm told is pretty much illegible for young Germans. And just like my Malaysian grandmothers' recipes, I see that Oma Frieda didn't include a method in her second recipe, just a list of ingredients. I guess some things stay constant across cultural boundaries! 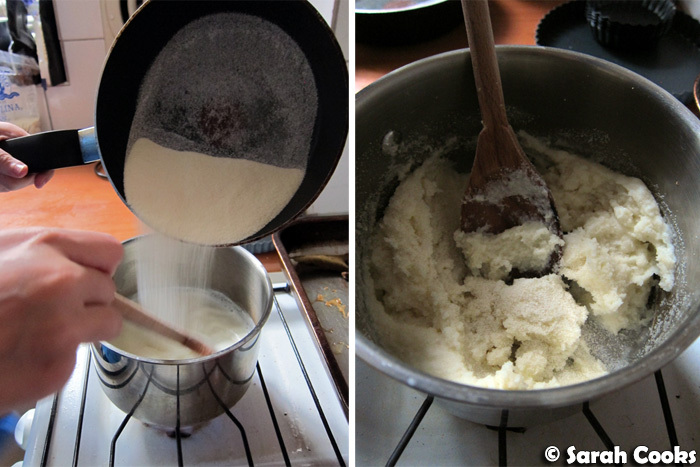 So, assuming that none of y'all read Sütterlin and have already read and understood the recipe, let me show you the steps. Then you add an egg and keep beating - elbow grease required here! Once it's all combined, you take it off the heat and drop spoonfuls of the mixture into your serving bowls. If you were making this for someone special, like a beloved grandchild, you could make the dumplings all nice and smooth and pretty or quenelle shaped. But I'm perfectly happy with messy-looking dumplings! As for the crunchy breadcrumb topping, I haven't specified amounts in the recipe below - only you know how much crunchy topping you want, and how buttery you like it! You just melt some butter (or lard, or Schmalz, or vegetable fat), add in some breadcrumbs and stir over heat until it looks like wet sand and has started to go crunchy. That's it! Sprinkle the crumbs over the dumplings and open a jar of sour cherries. I know it looks like I was a bit stingy with the cherries (only 8 in my bowl! ), but I tend to keep the jar on the table, and keep adding them as I go. And I do add a lot of sour cherries because I love them so very much! Heat the milk and water in a pan until just below boiling point. 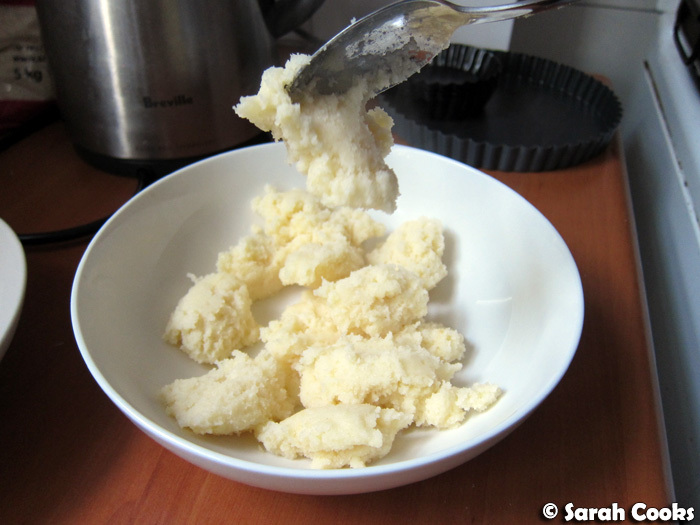 With the heat still on, add the semolina and salt, stirring well to form a thick paste. 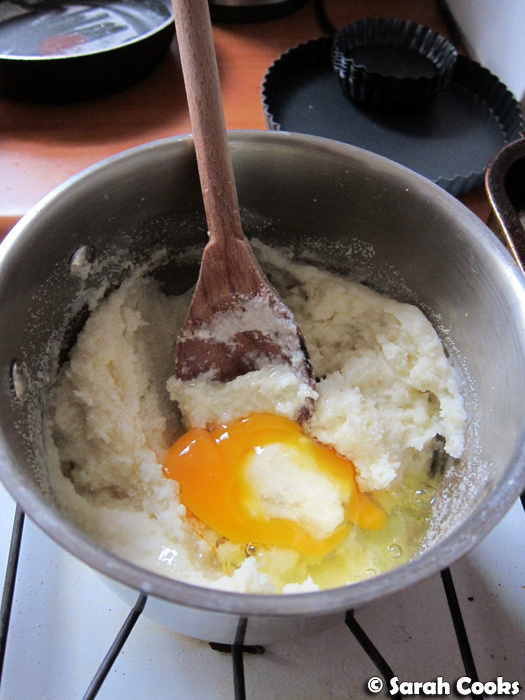 Add the egg and continue beating for a minute or two, until the mixture is smooth and the egg is cooked. Drop spoonfuls of the mixture into serving bowls. 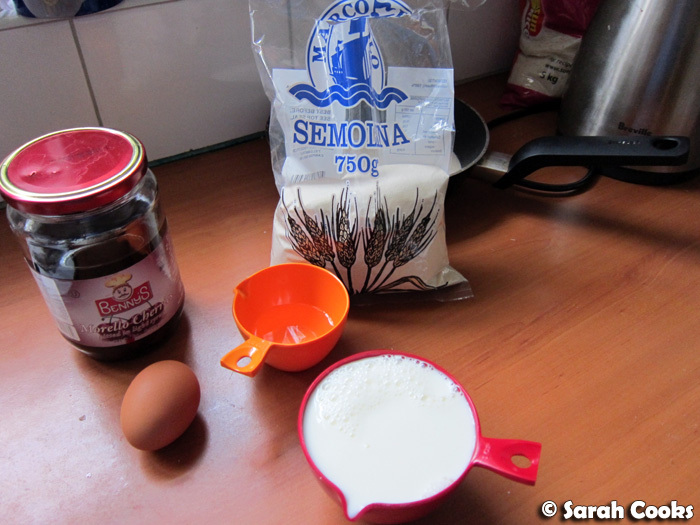 (You can make fancy quenelle shapes if you want, you can make them big, small, it doesn't matter). Melt some butter in a frying pan and add the breadcrumbs. 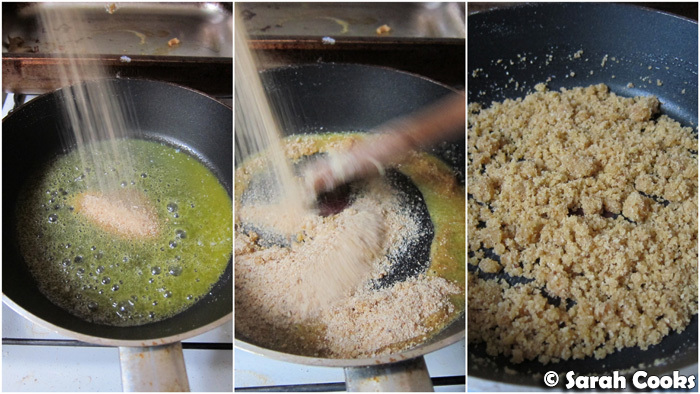 Stir until the mixture clumps together like wet sand and turns a bit crunchy. 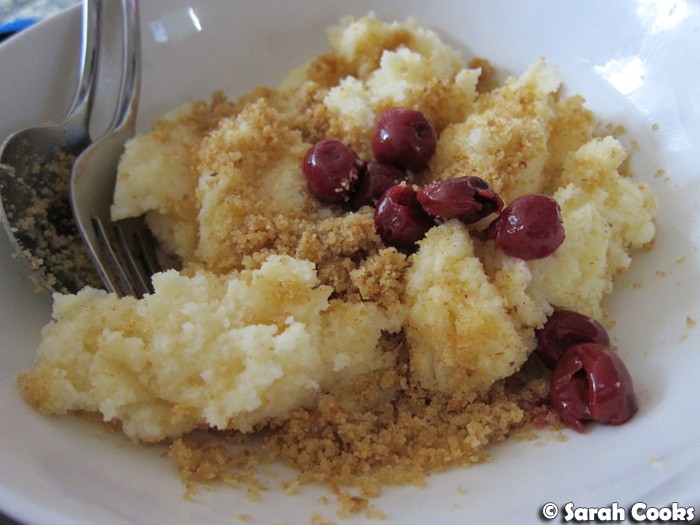 Sprinkle the crunchy crumbs over the semolina dumplings, and place the jar of cherries in the middle of the table for people to add as they like. Hello Sarah! Thank you for taking part in Bloggers Around The World! This is a very lovely post. I tried for a while to read the Sütterlin, but only managed a few rather obvious words. Maybe in a printed version it would be easier after a while, but combined with Oma Frieda's handwriting, no chance. After all, I'm not old enough to qualify for reading it. Yes, in Germany there are quite a few recipes that you would class as dessert, but are rather a complete meal. A bowl with Grießklößchen and Kirschen would be nice now! I can't wait to head back to Germany one day, as I've only been to Munich and Berlin and did so with the nastiest headcold I've ever had. I'd love to go back with my Dad, who lived there when he was my age and is now studying the language again in retirement. Chris - Thankyou for creating the challenge, it was a lot of fun participating! I googled Suetterlin after writing this post, and I thought it might be fun to learn how to write it, and use it on e.g. place settings or decorations. It's schoen! Hannah - Oh yes, you simply must go back and experience it in better health! I (obviously) highly recommend it. So many sweets! So many cakes! So much ice-cream! Lovely post! I can actually read Sütterlin (clearly I'm overeducated), but it was entertaining to see the other version. And yes, printed text is easier, for the curious. But that's not a skill I use very often, even working at a university in Germany. Anyway, the recipes and pictures look great, but...I'm afraid I don't like Grießklößchen, Grießpudding, or anything similar. A quick poll at work revealed similarly mixed feelings, with a serious north-south divide. I'm up north, and the northerners were much more anti-Grieß than those from, say, Koblenz and further south. I'm also not the world's biggest dumpling fan. Thankfully, that's also not the biggest thing going up here. Give me a herring any day. I do love the fact that Germany has such a regional food culture! Lauren - Thank-you for your thoughtful comment! That's so exciting that you can read Sütterlin - I'm glad to hear it hasn't fallen away completely. 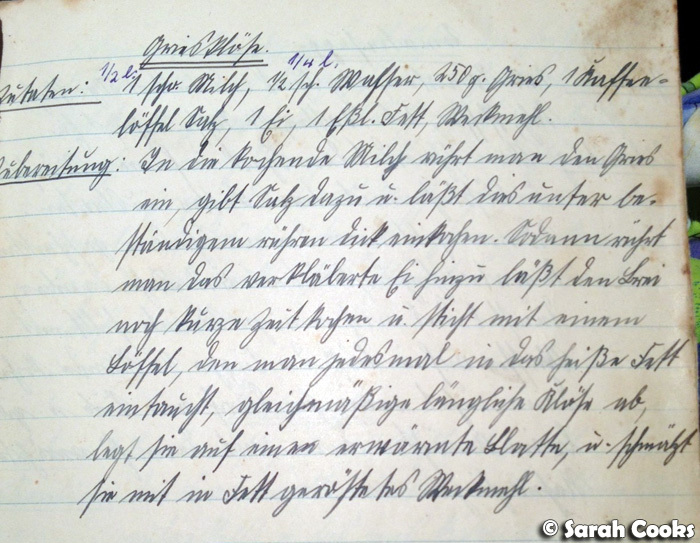 We're planning on scanning / photographing Oma Frieda's notebooks and are hoping to have them translated one day! So interesting to hear about the North/South divide! Funnily enough, my Southern-German family can't stand seafood, particularly herrings!